Liz Still and I travelled to the 2018 Insurance Conference at Sun City to launch the second edition of our comprehensive overview of the South African non-life insurance industry. 'Everything you need to know about non-life insurance in South Africa' was well-received by conference delegates, many of whom took the time to give positive feedback on the project. The annual insurance event, held this year from 29-31 July, is the perfect backdrop for any 'non-life' insurance initiative as it is attended by more than 1200 delegates from 30-plus countries, predominantly from African. It provides unprecedented opportunities to network with decision makers at insurers, insurance brokers, industry associations and various suppliers to the broader insurance industry. 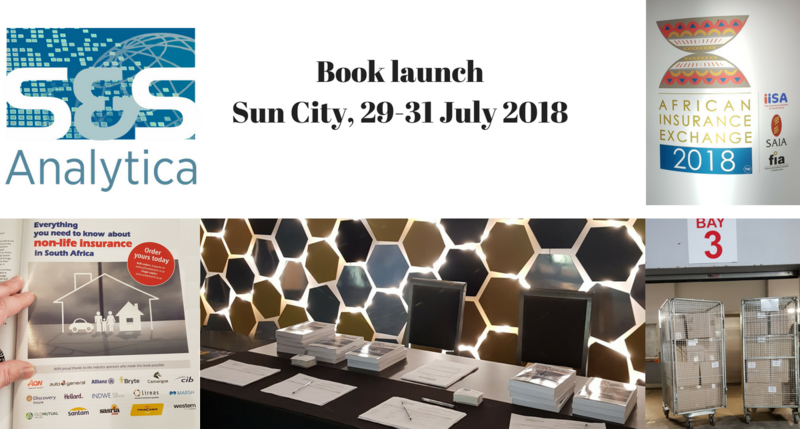 We chose to launch the second edition of our book at the conference to ensure as wide an introduction to industry stakeholders as possible - and we were not to be disappointed. We interacted with almost 800 of the delegates over the three days; quite an achievement for a team of two operating on the proverbial 'shoe-string' budget. Dr Joachim Wenning, Munich Re Chairman of the Board of Management, was on hand to give the keynote address on day one of the 45th Annual Insurance Conference. He observed that Africa’s strong economic growth prospects coupled with its young and dynamic population placed the continent at the forefront of business and technology innovation. In a presentation closely aligned with the conference theme of an African Insurance Exchange, Dr Wenning observed that the insurance and reinsurance industries could play a key role in realising the continent’s potential. Dr Wenning also took the opportunity to congratulate the group's Africa division on its 50-year jubilee in the region. “Over the past half century, Munich Re of Africa has consistently contributed to the African insurance industry, with support for product development and technical training in key areas like engineering and claims management," he said. In closing he said that the Group remained deeply invested in Africa's vision of an integrated, prosperous and peaceful continent, driven by its own citizens and representing a dynamic force in the international arena. The highlight from day two of the conference was undoubtedly the closing address by Advocate Thuli Madonsela, titled 'A new dawn for South Africa'. Advocate Madonsela shared some of her experiences over almost a decade as South Africa's public protector. She observed that South Africans from all walks of life would have to work together to create a less volatile environment. She also reflected on the cost of crime and corruption, saying that one either paid for one's 'wrongs' today (now) or sometime in the future (later). The most notable difference between the two was that paying in the future was more painful. As part of her presentation, Advocate Madonsela recited a James Patrick Kinney poem titled 'The Cold Within'. The poem, written in the 1960s, is a powerful comment on the harm caused by all manner of human prejudice. It ends with the verse: "Their logs held tight in death’s still hands; Was proof of human sin; They didn’t die from the cold without; they died from the cold within". In closing, Advocate Madonsela reflected on loyalty. "One of the things we struggle with is which loyalty to go for - unquestionable loyalty, or unquestioning loyalty - as long as you stay with unquestionable loyalty you are OK," she said. We conclude with a word of thanks to the Insurance Institute of Southern Africa (IISA) for allowing us to launch the book alongside their registration desk. We would also like to take a moment to thank the many delegates who interacted with us during conference, especially those who took the time to share some of their insights into the work we presented. We look forward to further interactions with our readers in the months ahead.